While there's debate over some of the amendments in the Constitution, everyone can agree the 21st is fantastic: it repealed the 18th, thereby ending Prohibition and all the interesting plotlines on Boardwalk Empire. It also gave name to the fantastic San Francisco-based brewhouse that for 15+ years has been creating some of the prettiest darn cans you'll ever see. We spoke to its founder/brewmaster Shaun O'Sullivan about the five beers he's drinking right now. And if you're looking to drink something right now, we'd recommend its bold, 70 IBU Brew Free! Or Die IPA. "This is the gold standard of the American pale ale style. In a sea of new beers with interesting, inventive flavors and ingredients, it’s an absolute pleasure to find this beer with its well-structured hop and malt bill. I’d put this in my desert island beer cooler." "As brewers of this style, this is the saison we all try to emulate. From its fruity flavors to tight, bright white bubbles and effervescent carbonation, this farmhouse beer is bottle-conditioned to age quite nicely. We try, but this beer delivers." "I know I’ll get heat from my craft brewing brethren, but everyone has their guilty pleasure, and this is mine. Sometimes you don’t want a craft beer, soda, or water. This scratches that itch -- it's light, crisp, and refreshing. No shame. Flame on." 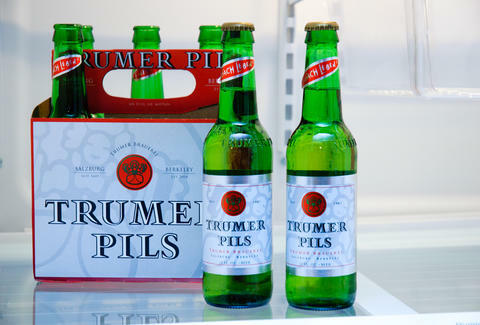 "Located in my hometown of Berkeley, Trumer Brauerei makes one beer, and they do it very, very well. This German-style pilsner is true to style and form with its crisp, clean malt flavors and brilliant use of Saaz and Austrian hops. It’s well made, and I don’t have to travel to Germany to find one." "This double IPA comes in at 8% due to its use of hops in all aspects of the brewing process, but its firm malt backbone supports its over-the-top use of hops -- it’s as good (if not better!) as this sentence is long. Find this beer!" Lee Breslouer is a senior writer for Thrillist, and could use a Sierra Nevada right about now. Follow him to cold beer: @LeeBreslouer.